Early childhood education is the foundation for your child's future. 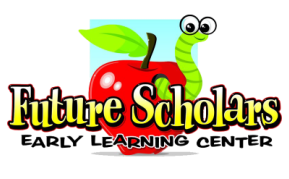 At Future Scholars we provide an environment where your child can develop the social and cognitive skills he or she needs throughout life. Our school is for children 6 weeks - 13 years old, with busing for our before and after-school program to and from Hainesport School. We treat every child who comes to visit with us like one of our own, allowing them to flourish in the understanding and encouraging environment we provide them. ﻿﻿﻿﻿We believe that since your child will spend some of his or her most impressionable years in our care, you should feel confident that he or she is happy, challenged, loved and comforted in your absence. Our goal is to build self esteem, enhance strengths and abilities, as well as teach responsibility as an individual. Classrooms at Future Scholars are divided according to our students' ages and abilities. Our philosophy is that challenges create interest and we strive to challenge our students every day to keep their minds and bodies moving. We are NOT just a daycare center--we are an important role model in your child’s daily life. The services we offer include activities designed with education in mind, social exercises that help develop an awareness of peer groups, and the general business of keeping an eye on the little ones’ needs. Of course, the children just think they’re having a blast the whole time. We implement the award-winning, nationally recognized, Creative Curriculum. Creative Curriculum is a play-based curriculum where teachers set the stage for learning, while children interact with and learn in various interest areas, including Blocks, Dramatic Play, Manipulatives, Science & Discovery, Music, and Art. We focus on using exploration and discovery as a way of learning, enabling children to develop confidence, creativity, and critical thinking skills. Every child learns differently, so our teachers are constantly observing their students in order to provide individualized instruction to each child. In addition to the Creative Curriculum, we implement the Handwriting Without Tears program to strengthen fine motor skills and develop pre-printing and printing skills, as well as letter and number recognition. See our Classrooms page for more detailed information. Top of the line security system with cameras to ensure your child's safety at all times.